Posted on February 25, 2019 at 4:21 pm. Our final Night Lights, RACC’s outdoor public art series, is wrapping up its 2018-19 season with The Midnight Variety Hour (MVH) – Night Lights Edition March 7, at 6pm. For RACC’s Night Lights Program, MVH will present a video program with live music, sound and vocals. MVH deconstructs the world of live television and the essence of the variety hour creating a dream-like memory of tv shows. Through the build up of layers and patterns of imagery and sound, MVH creates a landscape of distorted time and space. Some of the elements used in their live performances have included pre-recorded and live video, foley sounds, tap shoes, microphones, acoustic instruments, drums, synthesizers, and dance. Distinct sections of improvisation emerge through the tension and release of accumulated instrumentation, dance, and video. All works will take place at the north wall of the Regional Arts & Culture Council office at 411 NW Park Ave, Portland OR (on the corner of NW Glisan St and NW Park Ave). 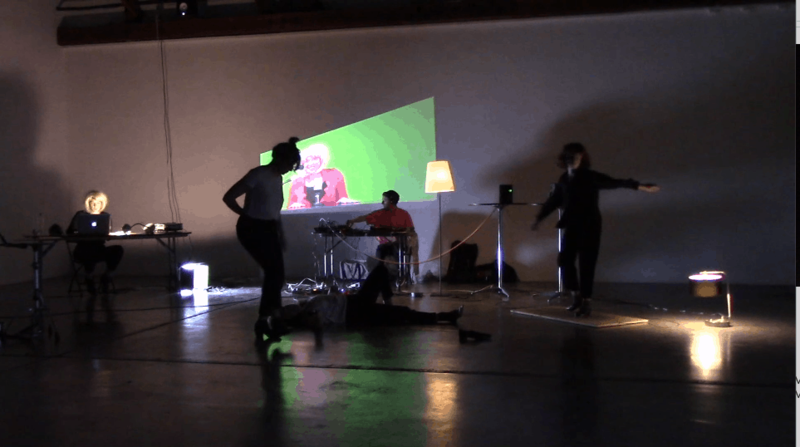 Midnight Variety Hour (MVH) is a collaborative project consisting of five multi-disciplinary dancers, performers, musicians, and filmmakers (Maura Campbell-Balkits, Sean Christiansen, Kelly Rauer, Fern Wiley, and Leah Wilmoth). Learn more about them here midnightvarietyhour.